When the unrest — the revolutionary activity, really — in the Arab world began, some of us thought: well, at least this will put and end to the crazy ‘linkage theory’ — the idea that the conflict between Israel and the Palestinian Arabs is somehow the root of all the troubles of the Mideast. [NPR host Guy] RAZ: Regimes. Few would argue that the imminent collapse of the Mubarak regime (and other Middle East dictatorships) derives from the Israeli-Palestinian conflict. 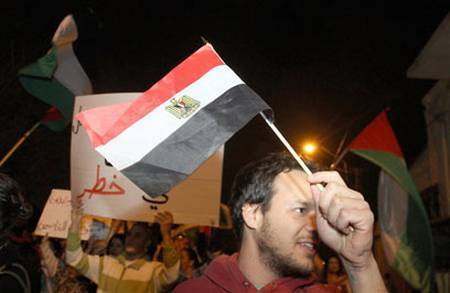 Neither Egyptians nor Tunisians are risking and losing their lives for Palestinians. They are doing it for themselves. They want freedom. It’s true that the average Egyptian cares little about ‘The Occupation’. He just plain hates Israel, Jews and the US, thanks to the antisemitic Egyptian media, which have been waging war on them since the days of Nasser and which were encouraged to continue to do so by the Mubarak regime. You’d think that if Mubarak was kept in power by the Lobby, it would have found a way to get him to end the incitement, wouldn’t you. As a matter of fact, most likely the only thing the reformers, ‘moderates’, Islamists, and everybody else in the Arab world can agree on is that Israel is the Devil and needs to be destroyed. A good argument can be made that as a matter of fact, it’s this attitude that prevents peace between Israel and the Arab states and Palestinian Arabs. And it’s not been very helpful to the Arab in the street either, who finds his regime using the conflict with Israel as an excuse for repressive measures against opponents, especially reform-minded ones, and for funneling money into military buildups instead of improving the general welfare. Of course then the regime turns around and blames Israel for everything from high prices to inadequate electrical service. Here’s a bright spot: the Mubarak regime has weakened the Egyptian military by appointing political cronies to all the high positions. Despite the American weapons, you still need competence to fight a war, and you won’t find much of that in Egypt today. Oh well, the new Arab regimes may turn out to be greater or lesser threats than the old ones (my money is on ‘greater’, I’m sorry to say). But some things never change. It’s almost comforting in this time of upheaval that they’ll still continue to hate us as before, and that their spokespeople in the West will continue to invert reality and twist the truth to come up with the same old conclusions. Demonstrator waves Egyptian flag -- in Cairo? No, in Yafo, next door to Tel Aviv! Remember the ‘linkage theory’ — the idea that the Israeli-Arab conflict was the ‘root’ of most of the trouble in the Mideast, and that ‘solving’ it (by establishing a Palestinian Arab state, of course) would usher in an era of peace and stability? Do you think this would affect the unrest in Egypt — or for that matter, in Tunisia, Yemen, Algeria or Lebanon? Maybe the strains between conservative Arab dictatorships and their liberal (weak) and Islamist (strong) oppositions play a role? Or maybe the project of the Islamic Republic of Iran to establish its hegemony in the region has something to do with it? Could it possibly be that some of this is actually not Israel’s fault? Hard to believe, I know. About 1,000 Jaffa residents hit the streets Saturday to protest the “phenomenon of Jewish settlement” in the mixed city located just south of Tel Aviv. Muslim and Christian residents, as well as Jewish left-wing activists, are charging that religious settlers who moved to Jaffa are abusing Arabs in town and stirring provocations. My goodness — here they are objecting to ‘Jewish settlers’ in a city that has been part of Israel since 1948! It makes one wonder what they mean when they call for ‘ending the occupation’. Here’s another Egyptian connection: the historic 1979 peace treaty between Israel and Egypt has proved in practice to be little more than an extended cease-fire. Radicals associated with the Muslim Brotherhood murdered President Anwar Sadat for signing it, and have called for its abrogation ever since. The Mubarak government, in consideration of billions in aid from the US each year, has avoided direct conflict with Israel. But it has refused to allow ordinary Egyptians to visit Israel, allows massive antisemitic incitement in its media — Mein Kampf is a bestseller and The Protocols of the Elders of Zion was serialized for TV — and continues to make anti-Israel and anti-American statements on a regular basis. Its army holds maneuvers each year in which Israel is the putative enemy. This regime has not been a great bargain, not for the US and not for Israel, which gave up the very strategic and potentially economically important Sinai for it. But if a Muslim Brotherhood-dominated regime were to get power — and keep in mind that it is the second most powerful force in Egypt, after the army — then it would likely tear up the treaty (it would also be an enemy of the US). Can you imagine another Israeli-Egyptian war? Especially after Egypt has pumped huge amounts of aid into high-quality American weapons? It wouldn’t be pretty, not for either side. But that’s what’s at stake there. Yesterday I wrote about the Birthright trip supposedly to be led by J Street U, the campus branch of the phony ‘pro-Israel’ organization J Street. I urged readers to write to Birthright and The Israel Experience, the ‘trip provider’ said to be organizing the tour for J Street. At first I thought that the press release from J Street U’s director, Daniel May, which appeared in several blogs (see here and here) was a hoax, because it didn’t appear on either the J Street or J Street U site. But one of the bloggers kindly pointed me to the signup page for the tour on J Street’s web site. Someone at J Street thought that it would be clever to trade on the good name of Birthright — after all, how could Birthright allow an anti-Zionist group to lead a tour? — and at the same time exploit the funding provided by truly pro-Israel donors and the Israeli government. The plan was to bring young people to Israel where they could meet with left-wing Jews and anti-Zionist Arabs, who would present to them J Street’s fundamentally anti-Zionist point of view. But they apparently ‘forgot’ to ask Birthright before announcing the program! This is a maneuver characteristic of J Street, which essentially exists to dishonestly use Jewish resources against Israel. So it accepts donations from well-meaning liberal Jews while also receiving funds from extreme left-wing sources such as George Soros and from individuals connected to Arab interests and Iran. I have asked Birthright and The Israel Experience to publicly disavow any connection to J Street or J Street U. Email addresses are in my previous post, if you want to do the same. JStreet has been asked to remove this page. No program has been more effective in creating Zionist consciousness in Jewish young people than Birthright. Israel really is a vital, democratic, modern and generally cool place, so sending kids there for ten days for free is the best way to arm them against the barrage of anti-Israel propaganda they face at college or among their ‘progressive’ friends. The trip is a chance to appreciate the vibrancy of Israel’s history, culture and landscape from a perspective that acknowledges your Jewish and progressive values. The best way to discover the richness of Israeli society and the full contours of the Israeli-Palestinian conflict is to travel around Israel and meet people from the diverse groups of the region. There is simply no substitute for seeing the land and connecting with the people. On the trip, we’ll speak with members of Israeli civil society working to advance the goals of democracy and human rights. Our itinerary will provide a cross-section of Israeli opinion. In other words, the phony ‘pro-Israel’ organization J Street, a group that takes money from people associated with Saudi Arabia, the Arab-American institute, Iranian interests, anti-Israel billionaire George Soros, a mysterious woman associated with the guy who beat the Hong Kong horse-racing track, and the Turkish producer of anti-Israel propaganda films; whose co-founder called the creation of Israel ‘an act that was wrong’; and which facilitated meetings between members of Congress and Judge Richard Goldstone, author of the notorious Goldstone report that accused Israel of deliberately murdering civilians in the Gaza war — this organization has the chutzpah to use funds provided by Taglit-Birthright to sabotage its purpose! …the Jerusalem municipality has been bending to the will of fanatic Jewish settlers, and producing -based on archaic documents from the Ottoman period and manufactured Israeli law– eviction notices to a number of Palestinian families, and in some cases -such as with three families in Sheikh Jarrah- acting on those eviction notices by force and removing those Palestinian families from their homes. The municipality’s actions are hugely problematic from a moral standpoint: not only are Jews buying up and/or stealing Arab land in East Jerusalem, but Arabs are moreover unable to buy land in the primarily Jewish West Jerusalem… These policies are also hugely problematic from the standpoint of peace, as East Jerusalem must be the capital of the future Palestinian state, and the Clinton Parameters, which state that Palestine will get control of Arab neighborhoods and Israel will control Jewish neighborhoods, are made harder and harder to implement with each infiltration of Jewish settlers into Arab neighborhoods like Silwan and Sheikh Jarrah. This is what they call “progressive Zionism!” If you ask me, it has ‘progressed’ to the point that it can’t be distinguished from Arab propaganda — Ali Abunimah could have written that paragraph. Now I am not saying that, distasteful as it is, an anti-Zionist organization like J Street U can be prevented from leading a trip to Israel in which young people will meet various Jewish left-wing extremists and Arab anti-Zionists, perhaps participate in a demonstration or two, and in general see the country through the eyes of those who hate it. But I think it is highly inappropriate that funds that have been given to Taglit-Birthright by Zionists like me and by Israeli taxpayers should be used to pay for it! So I suggest that you contact Birthright — you can email them at information@birthrightisrael.com and ask them if they think that the anti-Zionist organization J Street U should be allowed to lead a Birthright trip. Birthright works through ‘trip providers’ like The Israel Experience Ltd, in Israel — a subsidiary of the Jewish Agency. You can email the Deputy Director-General of TIE, Eran Applebaum at eranap@israelexperience.org.il, and ask him if he thinks his organization should be helping J Street to damage Israel. Do it now. I have, and I’ll report on any results. Update [27 Jan 1307 PST]: This press release may have been a hoax. It does not appear on the websites of either J Street U or J Street. I found it in two blogs, here and here. Both of the writers took it seriously, but I’ve been told that Birthright denies that there will be such a trip! Update [1629 PST]: It’s for real. Here’s the signup page. From an Israeli point of view, Hizbullah’s move into plain view may also bring advantages. For a long period, the non-Hizbullah “government” of Lebanon functioned for the Shi’ite Islamists as part cloak, part human shield. Well, he may have a point there, but consider that Lebanon, once a democracy, is now a full-fledged client state of Iran, ruled by an extremist Islamist party. Lebanese Sunnis and Christians are disenfranchised. The West loses one (of course, it’s been ‘losing’ Lebanon for a long time, but now it’s final). Second, and probably-going-to-be-bad: Egypt. Whether the violent protests there will turn into a true revolution is unclear. But if they do, the history of revolutions (viz. 1789, 1917, 1979) indicates that rarely do they bring better government (the American revolution wasn’t really a revolution, it was a secession) — usually the most ruthless party carries the day. In Egypt, that probably means the Muslim Brotherhood, yet another extremist Islamist party. Even if this blows over, Hosni Mubarak is 82. How long will he continue to control Egypt, a country of 80 million, with the world’s 10th largest military — one which is armed with high-quality American equipment? Protests have also been occurring in Jordan. The King has announced moves to improve the economy, but of course that will not help insofar as his opponents are Muslim-Brotherhood Islamist types, who don’t care a fig about the economy. There have been demonstrations in Algeria and Yemen as well. The Tunisian revolution which first inspired the unrest hasn’t run its course. It remains to be seen what kind of regime will replace the corrupt dictatorship of former President Ben Ali. Most commentators think it won’t be Islamist. Don’t bet on it. Third, consequences still unclear: The Palestinian Authority (PA). The PA has been buffeted by an attack launched by Aljazeera, probably orchestrated by the Iranian bloc. The so-called ‘Palestine papers’ will not have much effect on the image of Israel in the West — partisans on both sides are already interpreting them in accordance with their own positions — but they have wrecked the position of the PA in the Arab world and boosted Hamas. 1. Most of the routine material comes from actual documents but not the “interesting” parts that everyone is talking about. 4. In addition, the Guardian and al-Jazira often distort what is in the documents to exaggerate it even more. Some of the specifics are really absurd like the legalistic-minded Tsipi Livni saying she is against international law and even saying she planned to expel Palestinians from Israel after an agreement. 5. Yet almost all of the media uncritically quote these distortions. It will be interesting to see if the US will be able to continue supporting the PA. Of course, keep in mind that the ‘papers’ discredit the PA in Arab eyes by purporting to show that they are not an extremist organization, and are willing to compromise! These three events represent the dawning of a new Middle East — unfortunately one in which both democratic and conservative non-Islamic forces have lost ground to radical Islamism. And one which isolates Israel even more.